This is a review I have been wanting to write for a long time, but I wanted to make sure I played through the game a few more times before I wrote it. The rules are so complex in comparison to many of the other board games I play that each time we played, there was some aspect we messed up. I first played Power Grid in 2007 with my brother and then didn’t play again until 2014 (which ended up being a 3 hour, 6 player game where I was the only one who had played before and I had one game under my belt). I got a copy for Christmas in 2016 and managed to talk some friends into playing with me over the past year, and despite my early impressions from 2007 and 2014, I think Power Grid has grown into one of my favorite board games of all time. I feel like it is important to note: Power Grid is not a game for beginners! 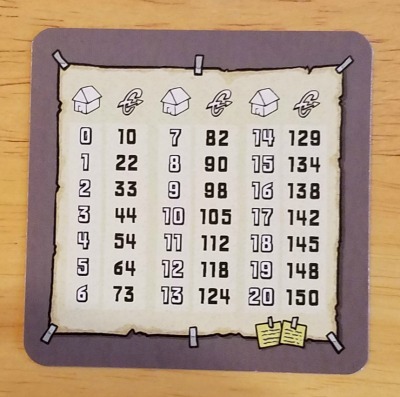 Given the number of steps that take place each turn and how the rules change as the game progresses, players experienced in more complex games may find more enjoyment here. Believe me, when you don’t follow the rules in Power Grid, the game balance spirals out of control fast. 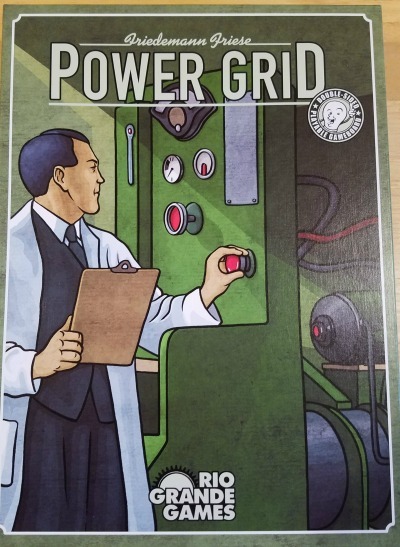 Power Grid, designed by Friedemann Friese, was originally published by Rio Grande Games in 2004 and plays up to 6 people. There have been 10 expansions over the years, with the most recent released in 2013. Each expansion changes the map you play on and the fundamental rules of the game (such as the power plant market, the resource market, etc.). There is also an expansion deck that adds new power plants to the game for variety. I currently do not own any of the expansions, so everything discussed here will be for the base game. This is the standard version of Power Grid. A deluxe version is also available, as well as a number of expansions. Players take on the role of a power utility with the goal of creating the largest network of powered cities. To do this, players have to invest in new power plants, manage the resources required to run those plants, and expand their network of cities. Power Grid has elements of board control and economy simulation, and to a lesser degree, return on investment and risk/reward evaluation. The back of the Power Grid box. Setup in Power Grid is pretty easy, although there are a few things to note. First, the starting resource market is in the Preparation section of the instructions and does not mirror the Step 1 resource replenishment table on the final page of the instruction manual. Second, players are confined to their regions in Step 1, so if playing with fewer than 6 people, take care to only play in regions that are adjacent to each other. Third, the power plant market always starts with power plants 3 through 6 on the available market, 7 through 10 on the future market, and power plant 13 is always the first to be drawn. The instructions don’t tell you until the end, but you’re also supposed to remove a set number of power plants at random from the game based on the number of players. The rest of the power plants are shuffled, power plant 13 is placed on top, and the Step 3 card is placed on the bottom. The top row is the current market, available for auction. The bottom row are power plants that will become available on the future market. Finally, it is very important to pay attention to three things: (1) if playing with fewer than 6 people, play does NOT extend into the empty regions once Step 2 is reached, as this completely unbalances the game and allows players to reach the requisite number of cities to end the game very quickly; (2) players should pay special attention to the rules that drive the auction market and when power plants are removed from the game (this happens during Phase 5 (Bureaucracy) each turn, but can also happen when Step 2 is triggered, when players reach certain thresholds in their city networks, and when owning more than 3 (or 4 for two player games) power plants); and (3) pay attention to when Phases proceed in player order and when they proceed in reverse player order. Failure to adhere to these rules breaks the game in some interesting ways and, in my experience, allows the player with the most cities in their network to gain massive and unbeatable advantages over their opponents. However, if you follow the rules of the game, it is surprisingly balanced and fun. Speaking of rules, Power Grid has a lot of them. I don’t normally dig into the minutiae of the rules and expect players to learn them on their own, but Power Grid is very rules heavy, and I think potential players should understand a little about how the game plays out if they’re weighing a purchase. 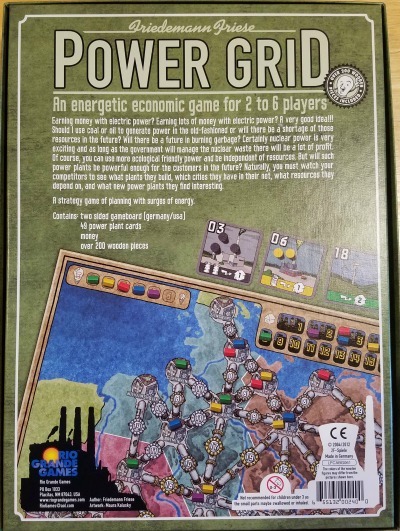 Power Grid plays out over 3 Steps, each of which is made up of several turns. Each turn is made up of 5 Phases. Rules change when transitioning to Step 2 and again in Step 3. Confused yet? Let me try to break it down easier, because the instruction book is pretty convoluted. Whoever wrote the manual managed to hide some key pieces of information in “Examples” instead of in the instructions, and if you forget to do any single thing during a Phase, the game’s balance falls apart. Read the instructions very carefully! Play starts in Step 1. Once any player or players have expanded to 7 cities, Step 2 begins in Phase 5 of that turn. At that point, the market resupply changes and the lowest rank power plant available for auction is removed from the game. Step 3 begins when the players draw the Step 3 card from the power plant deck during auction, after which the power plant market changes and all plants are available for purchase (i.e., the future market disappears). Always read the examples in the instruction manual. These hide a surprising number of rules that are not explicitly documented in the instructions. 2. Auction Power Plants – Phase 2 plays out in player order (i.e., Player 1 goes, then Player 2, etc.). On the first turn of the game, everyone has to buy a power plant, but on subsequent turns, players can elect to pass on auction. When a player starts an auction, they select a power plant from the market and announce their starting bid. No player may start a bid at less than the number on the face of the power plant. The player to the left has the option to outbid on that power plant or pass. Once a player passes, they cannot re-enter the auction. Bids continue in clockwise order (not player order!) all players but one pass with the winning player paying the full price of the auction. That player receives the power plant and a new one is drawn immediately to replace the one auctioned. If the player who started the auction wins, the next player in the turn order starts a new auction. Players can only purchase a single power plant per turn and can only have 3 power plants at any given time (4 in a two player game). When a player buys their fourth power plant, they choose one of their plants to discard immediately and these plants do not re-enter the market. If no players purchase power plants in a turn, the lowest rank power plant is removed from the game and a new one is drawn from the stack to replace it. 3. Buy Resources – Phase 3 plays out in reverse player order (i.e., Player 6 goes, then Player 5, etc.). Each player has the opportunity to purchase resources to power their cities based on the power plants they have in their possessions. Each power plant has specific requirements for what type of fuel it uses (coal, oil, garbage, and uranium are options), how many units, and how many cities it powers. Lower level power plants are only capable of providing energy to one or two cities for two or three units of fuel, while later power plants can power more cities for fewer resources. Each power plant can only hold double the resources required to operate it and the market is dynamic, so hoarding resources can allow you to save cost later (if you know you’re going to expand this turn and move up the player order, thus allowing other players to buy resources before you) or to control the market (by buying up cheap resources that another player needs to power their plants). The resource market adjusts based on how many units of a given resource are available. 4. Building / Expanding Network – Phase 4 plays out in reverse player order. Players can choose to add cities to their network, which effects their player order, potentially triggers Step 2 of the game, and allows them to earn additional money and maximize their utilization of power plants. The players pay the cost associated with expanding, which is the sum of the connection cost and the standard price of the city. Players can purchase as many expansions to their network as they want or can afford each turn. Example of a game in Step 2. Players have a monopoly in their home region in Step 1, but once any player has expanded to every city in their starting region, Step 2 begins and players can expand to neighboring regions. 5. Bureaucracy – Phase 5 plays out in player order. Players choose how many cities to power, spend the resources to power the appropriate power plants, and collect the cash based on that number. The market is resupplied based on the number of players in the game, the Step of the game (coal is cheap and abundant in Step 1, while garbage and uranium become predominant in Step 3), and the resources available in the pool. If any player has expanded to a number of cities greater than the lowest rank power plant on the market, that power plant is removed from the game. Additionally, the highest value power plant is removed from the market and placed at the bottom of the stack. The most valuable power plants will reappear in Step 3 of the game. Using resources to generate power for cities in your network scales according to this player aid. Resources are replenished in Phase 5 depending on the Step of the game and how many players. The game ends in Phase 5 on the turn the first player builds a city expansion that meets the “End Game” condition. The winner is the player who can power the most cities (i.e. earn the most money on the final bureaucracy phase), not necessarily the player who has access to the most cities. If a player does not have the resources to fully power their network of cities, they only get credit for the cities they can power. The number of cities to trigger end game is dependent on the number of players in the game. 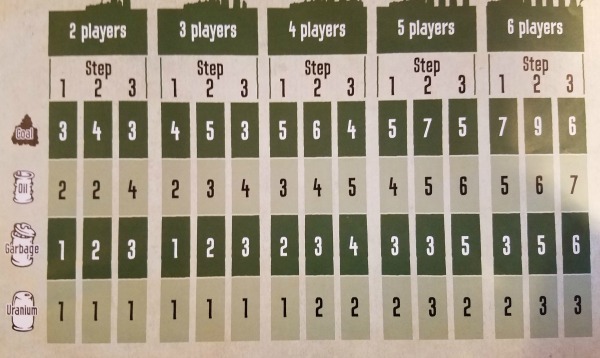 A table in the back of the instruction manual outlines many of the game’s conditions that are dependent of the number of players. As I have mentioned before, because Power Grid is so heavy on rules and without following them, some players gain unfair advantage, I would strongly recommend playing with people who are comfortable with complicated board games. The box says the game should take an hour and fifteen minutes to two hours to complete. As I mentioned before, a 6 player game where I was the only one who had played the game before took 3 hours. This occurred because the game doesn’t give any indication of what power plants are good or bad, when auctions get too high for power plants, whether prices are reasonable for resources, and whether it is in the player’s best interest to expand. This can lead to indecision among players in Phase 2 and Phase 3 of every turn. Power Grid doesn’t hold your hand, but instead expects you to determine the values of these things yourself, which is where the “return on investment” analysis aspects of the game come in. Power plants end up being replaced fairly often, so look for a return on investment in 3 turns or less, otherwise you may end up losing more money on purchasing new plants than you gain on powering the cities before you replace them. I have found that having an experience player who knows the rules and is willing to act as a “game master” can drive the game forward at a pleasant pace. This person’s job is to keep track of what Phase the players are currently in, player rotation in that Phase, and to ensure that the rules changes associated with a change in Step or how the auction house changes. A second player who can help out as a banker can also speed things up. Utilizing these strategies, a 3 player game lasted just an hour and fifteen minutes and a 5 player game lasted an hour and forty five. Both times, the game was played with experienced players and included the rules explanation. 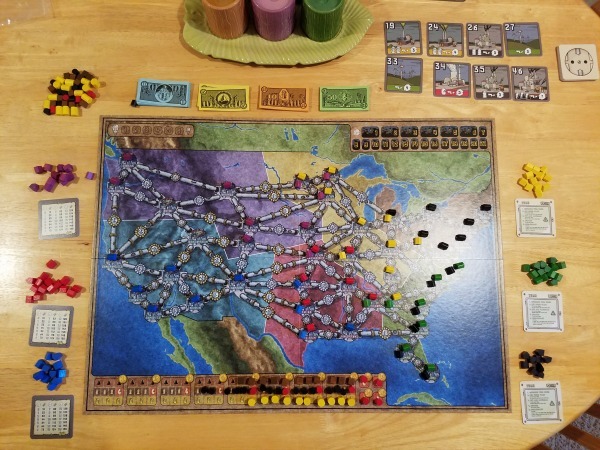 Power Grid definitely does not get tabled every week at game night, but it is a good game to sit down with close friends and some drinks or snacks and make an evening of it. The constantly fluctuating power plant auction market and resource market mean that each game is different each time, and the slower pace means there’s usually time for table chat while players are making decisions. Amazon currently has Power Grid for $34 (as of the time of this post), but I have seen it drop as low as $25 before. At that price, I would strongly recommend any experienced board gamer to keep a copy on their shelf. Beginning players who are detail oriented and are looking to transition into more complex games should check it out, but be aware that play times will be longer for them until they get comfortable with the rules and the layout of the rulebook. A full list of expansions can be found on the Wikipedia page for the game and they range in price between $10 and $25.